In this article I am sharing with you the basic steps I always follow after installing WordPress. Installed WordPress? Here’s What to Do Next! The following 15 actions assume that you have successfully installed WordPress and you are logged into your WordPress admin dashboard. WordPress websites get hacked everyday, and more than often this happens due to poor login credentials. Hackers don’t try to hack websites manually. They use brute-force scripts to try and get into your precious website. That’s why it’s crucial, before you do anything else, to configure a good username and a password that nobody else can possibly guess. When you installed WordPress, you probably had to configure a username. In the WordPress admin dashboard, you can’t actually change that username. If you’re happy with the username, awesome. If you’re not happy, simply create a new user and configure it the way you want it to be. The username is essentially the login name. If hackers can easily work out the login name to your website, you’re basically giving them a massive head-start. Therefore, you should never ever use the name “Admin”. This sounds very obvious, but you’d be surprised how many webmasters actually use this name for convenience reasons. You should also configure a nickname and a display name. A nickname is exactly that. A simple name that you’d like people to call you. The display name is the name that your readers will see on the site, for example in the author bio and below a blog post. You can choose to have the username (login name) or the nickname to be the display name. I recommend to pick a good nickname and to set that as the display name. Some WordPress themes display the author name at the bottom of a blog post including a link to the author archives page. The author name in the URL of this archives pages is typically the same as the username. This is another way for hackers to work out what the login name for your website could be. Read this article for a technical workaround for that security vulnerability issue. By default, a WordPress installation comes with several free themes. One of these free themes will be the one that is activated. Choosing a theme is an important step because a theme has a huge impact on the success of your WordPress blog. A theme should match your expectations in regards to look and feel. A theme should be a good reflection of your brand. In addition, a theme should be well-programmed and regularly updated. You can either keep using a free theme, or you can decide to purchase a premium theme. It’s important to delete any themes that you’re not using, as they can make your website a lot heavier. Just like with plugins, only use what you really need. In other words, you should really just have one theme installed. My favorite WordPress theme right now is GeneratePress, a super lightweight theme with tons of customization options. GeneratePress is highly regarded in the blogging community, with some of the biggest Internet marketing blogs out there using it. Go to General Settings within your WordPress admin dashboard to change the site title and tagline. These details typically end up in the browser title so it’s important to enter something that makes sense. The site title is simply the name of your blog, website or e-commerce shop. The tagline describes in a nutshell what your site is about. 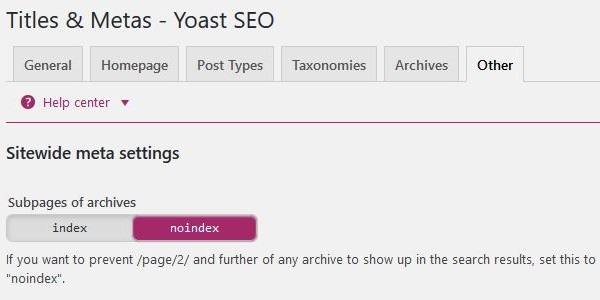 Although you can override these settings, for example with the Yoast SEO plugin, it’s still useful to have these details correctly configured here. The WordPress address can be with or without the “www” bit. It’s crucial that what you choose here is the same as your preferred setting in Google Search Console. For example, if you choose “yourdomain.com” without the “www” bit, and someone tries to navigate to “www.yourdomain.com”, it will redirect to “yourdomain.com”. In Google Search Console, you need to make sure that you configure the preferred domain to be the same as what you configure in your WordPress admin dashboard, in this case “yourdomain.com”. Google will then display that preferred domain in the search results. The site address is important if you want your WordPress installation to be different from your website’s actual home page. Also, if you have a HTTPS website, make sure you configure this accordingly. The home page of your brand new WordPress blog can be either a custom made page, or it can simply be a summary of the latest blog posts. When you’ve just installed WordPress, you won’t have any content so this setting isn’t all that important yet. But it’s good to know that this setting exists. You may want to prioritize creating a custom home page (even if it only says “coming soon”) and set that to be the front page for the time being. 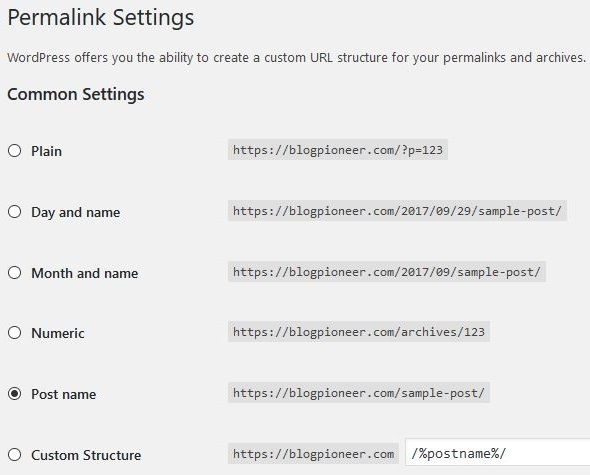 The permalink settings determine what the URL structure will look like for your permalinks and archives. For example, you can choose to have the day, month and year included in the blog post URL. Or you can have a numeric value instead of the blog title in the URL. The best option? Just the post name. No dates or numeric values. Unless you find the date to be useful for your readers, there is no benefit to have this included in the URL. Numeric values are even worse, because they don’t mean anything. In addition, the search engines will frown upon it too. In general, search engines like short and descriptive URLs. Dates and numbers don’t add any value and can harm your SEO efforts. Plugins can have a big impact on both the security as well as the performance of your website. The more plugins you have installed, the worse your website will perform. In addition, plugins can create mysterious website bugs and errors that are tough to trace and resolve. By default, a WordPress installation will have several plugins installed. And your hosting provider may also include several plugins if they install WordPress for you. The only default plugin that is useful is Akismet, one of the best anti-spam plugins available. Once your WordPress blog is live, you will soon start receiving a lot of spam comments. A plugin like Akismet helps identifying these comments so you don’t have to waste your time. You can safely delete all other plugins that were installed for you. A caching plugin helps to increase the performance of your website. While there are many factors that can have an impact on how fast your site loads (such as having too many plugins), a caching plugin is very effective in speeding things up. Not only do visitors drop out when your site loads very slowly, site speed is also a SERP ranking factor. Navigate to the plugin section within your WordPress admin dashboard, click Add New, and search for “cache”. You’ll then see quite a lot of cache plugins listed. I recommend you choose one that has at least 100 positive reviews (which means it’s been around for a while). While most of them are good plugins, I personally use W3 Total Cache. It can take a bit of time and effort to configure everything, but W3 really does help speed up your site. One way to promote the content on your website is by using social media. You don’t even need your own social media accounts to achieve this. Social media share buttons allow visitors to your website to share content on their own social media channels. Social media signals are actually also a ranking factor, so it’s important to have functional share buttons available on your website. There are literally hundreds of different plugins available for this, some really good, others not so good. I have used a lot of different plugins over the years, and the one I would like to recommend is Social Warfare. It has a free and a paid version. SEO plugins help you with optimizing pages and posts so that Google likes them. If you’re not too familiar with SEO, don’t think that installing an SEO plugin will get you tons of organic traffic from Google. SEO is very complicated and requires a lot of hard work. Installing an SEO plugin is a good first step in the right direction and will help you better understand how on-page SEO works. The two biggest SEO plugins available are Yoast SEO and All in One SEO Pack, both with more than 1 million installations! They are both very good plugins, but I personally prefer Yoast as it has a really good user interface. An XML sitemap is very important as it allows search engines to better crawl your website. When you submit your website to Google Search Console, it will ask you to submit a sitemap, so it’s important to have this set up straight from the start. Once this is set up, you don’t have to look after it anymore, as it will update itself automatically every time you publish new content. 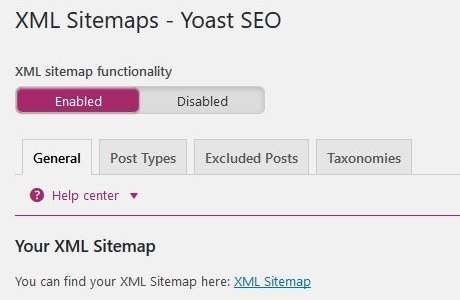 One of the easiest ways to configure an XML sitemap is with Yoast SEO. In fact, Yoast will do this automatically for you, all you need to do is enable this option. What’s awesome is that Yoast also allows you to include or exclude certain elements in the sitemap. For example, you can choose to exclude tags, categories, or even specific blog posts if you don’t want Google to find these. I use the Yoast plugin to configure how the titles and metas should be displayed. For example, you can configure what the title separator should be. Title separators appear between your post title and site name. If you look in the title of your browser, you will notice that I use this “|” symbol as the separator. You can also configure which post types, archives and taxonomies you would like to have indexed or not indexed. I personally don’t want tag archive pages to be indexed as I don’t see any value in them. In addition, they can lead to a duplicate content issue that I always want to avoid. One more important setting I’d like to point out is the sub pages of archives. For example, when you have lots of posts under a certain category, most likely that category page will have sub pages. It’s a good idea to have those sub pages not indexed, to avoid duplicate titles and descriptions which Google really does not like. In fact, Google will tell you about it in your Google Search Console dashboard. One of the most important things WordPress bloggers fail to do is regularly backing up their websites. Unfortunately, websites do crash, blog posts do get lost, hosting providers do go bankrupt, and most importantly, blogs do get hacked every single day. The most basic thing you can do to protect yourself against this kind of misery is to have a backup strategy in place. Most hosting companies provide backup options. Most of my websites are hosted with DreamHost and within my DreamHost panel all I need to do is press a magic button and everything related to my hosting account gets backed up automatically. This backup includes websites files, databases and mailboxes, and remains on the DreamHost server available for download for a period of two weeks. Very convenient. There are also several WordPress plugins that can take care of your backup procedures if you don’t want to rely on your hosting provider. Often overlooked, a site icon, or favicon, helps to give your site a bit of an identity. In addition, Google likes it too. Configuring a site icon in WordPress is very easy. Go to the home page of your website (while logged in) and click customize from the top bar. Navigate to site identity and simply upload an image that meets the requirements. 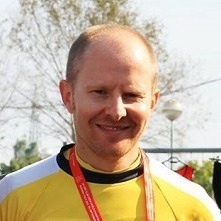 The image needs to be square and at least 512 pixels in width and height. Too easy. To kick off the content creation work that now awaits you, it’s good practice to start with an about and a contact page. These pages don’t have to be massive articles. Just briefly describe what your website is about, add an image, and hit publish. Boom, you have your first piece of WordPress content live. The contact page can be very simple too. I recommend you install Contact Form 7, by far the best WordPress contact form plugin. It lets you easily configure and customize a contact form within minutes. Then all you have to do is include a shortcode in your contact page, and readers can contact you via email. Don’t forget to include the about and contact pages in your menu structure. Once you have that all set up, your brand new WordPress blog is slowly starting to take shape! Installing and configuring WordPress is the fun part. Well, for me at least, but that’s because I’m still a bit of a tech head and I enjoy getting things right. After installing WordPress, and setting everything up, the hard work now begins. Now it’s time to start producing and promoting content, set up your social media channels, and so forth. If you’re new to the world of blogging and affiliate marketing, trust me when I say that this is seriously hard work. Never underestimate the time, energy and perseverance that is required to grow a website into something big. It doesn’t happen overnight. And this is also the main reason why so many new WordPress blogs and websites die out after only a few months. So as long as you are willing to put in the hours, you will succeed. And of course, keep following best white-hat SEO principles.